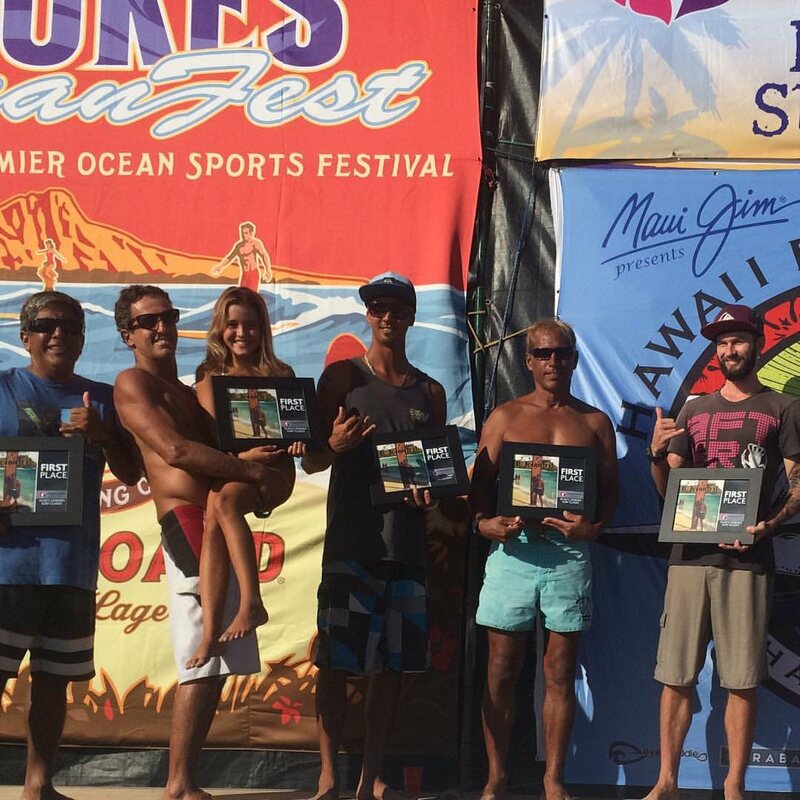 After 4 years of competing in the "Hawaiian Airlines (http://www.hawaiianairlines.com) Legends Surf Classic", it was a charmed year for the Tiki's Grill & Bar surf team (https://www.facebook.com/media/set/?set=a.10153051742782452.1073741842.46208052451&type=3), consisting of: Hunter Lewis (yellow rashguard), Kevin Prior (white), Romulo Fonseca (green) and Rick Perez (blue), and their Surf Legend Team Rider Clark Abbey (red). 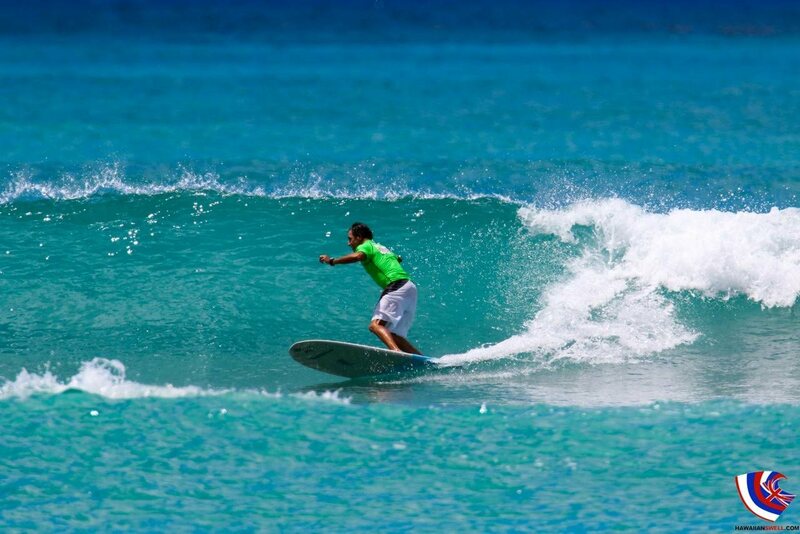 ​This two-day competition at Kuhio Beach/Queens Surf at combines sponsored teams of amateur surfers with the sport’s legends in this pro-style surf meet featuring heats, judges, a public address announcer, and exhibit booths. Net proceeds raised benefit The Outrigger Duke Kahanamoku Foundationʻs (http://www.dukefoundation.org) scholarships and grants program. ​Duke's OceanFest (http://dukesoceanfest.com/)is held each summer in Waikiki in honor of Hawaiian legend Duke Paoa Kahanamoku (https://en.wikipedia.org/wiki/Duke_Kahanamoku), who is fondly remembered as the greatest waterman who ever lived, and Hawaii’s ambassador of Aloha. Besting a field of 22 teams from around Oahu and Kauai, the team got off to a great start on the first day of competition by scoring the highest score total of the event (126.4) with the next highest score being 15 points below that! The field of competitors saw surfers of all levels, including professional longboard surfers who compete regularly and are highly skilled. The scoring was lead by Hunter Lewis and Kevin Prior, who both brought in scores as high as 9.5 (10 being a perfect score). 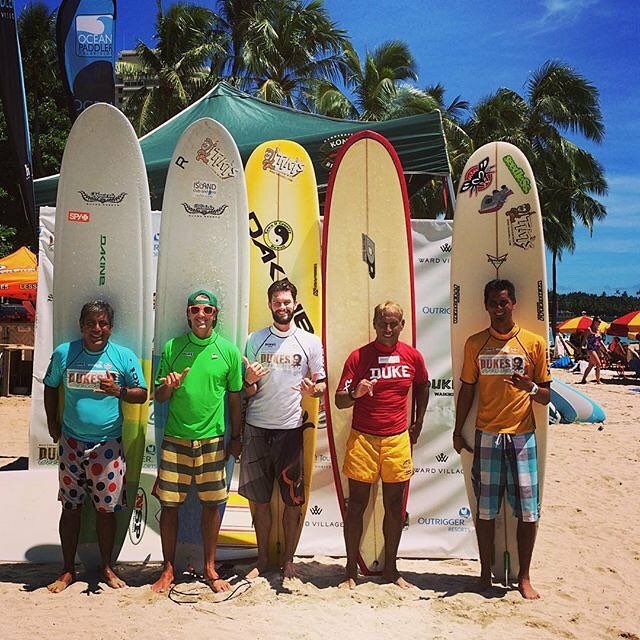 Romulo and Rick also surfed very well and supported the team with solid scores. 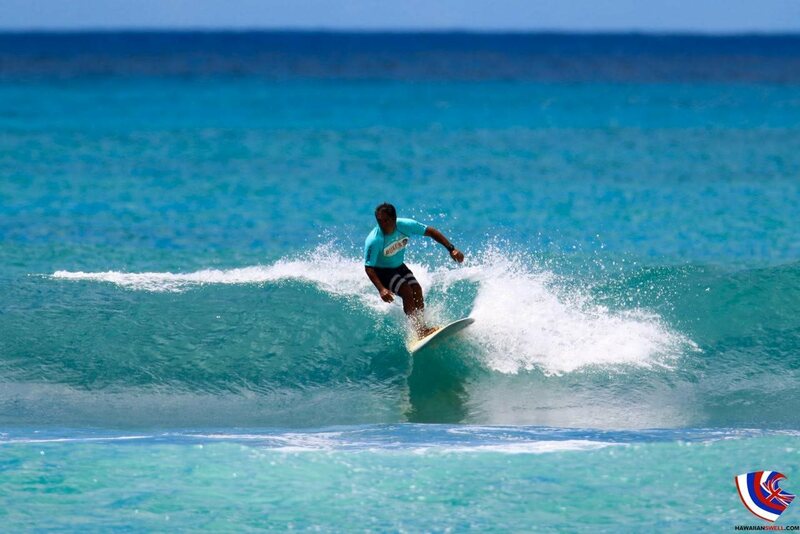 Team Legend Clark Abbey added the icing on the cake by showing his nose-riding skills - not bad for a Waimea Bay regular! ​The second day was a little more challenging, with the surf dropping and the judges being a little more frugal with the big scores, but once again Kevin and Hunter brought their A-game and the rest of the team followed suit. 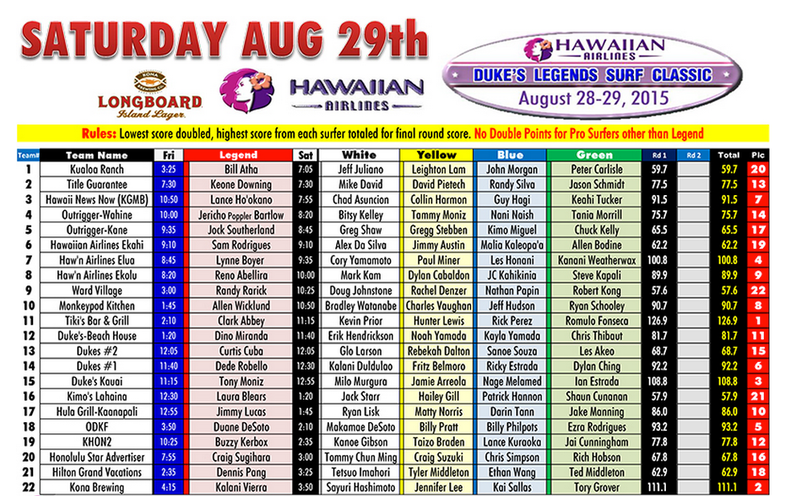 At the end of the day, when the totals were tallied, Team Tiki's was in the final against Duke’s Kauai, led by surf legend Tony Moniz. The 25 minute final heat brought less waves than earlier in the day, but Team Tiki's managed to score a respectable 91 in the finals. When both teams were brought to the podium for award presentations, the score for the Duke's Kauai team was not posted, to add to the suspense. When the total score of 89 for Duke's Kauai was read out loud, our team was overwhelmed with emotion and pride. After four years of third and second place finishes, our boys finally have their elusive win. I'm sure the team is already looking forward to defending their win next year. A Hui Ho guys, and great job! 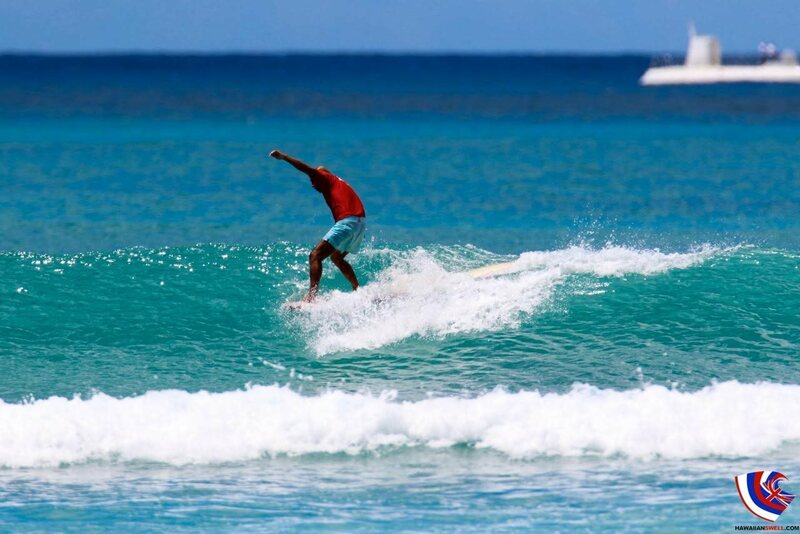 ​The annual Duke's OceanFest features a variety of ocean sports that were close to Duke Kahanamoku's heart, including Longboard Surfing, Paddleboard Racing, Swimming, Tandem Surfing, Surf Polo, Beach Volleyball, and Stand-Up Paddling. The festival is held each summer in honor of Duke Paoa Kahanamoku, remembered as Hawaii’s ambassador of Aloha and the greatest waterman who ever lived. Among his many accomplishments, Duke Kahanamoku was an Olympic gold medal swimmer, a surfer, an esteemed canoe steersman, a Hollywood actor, and the Sheriff of Honolulu. The festivities commence with a lei draping ceremony at Duke's statue. Duke’s birthday celebration is on August 24th, and festivities continue with the KINE Luau and Waterman’s Awards. The festival celebrates Duke Kahanamoku’s life, his athletic contributions, and of course, his spirit that still lives on. 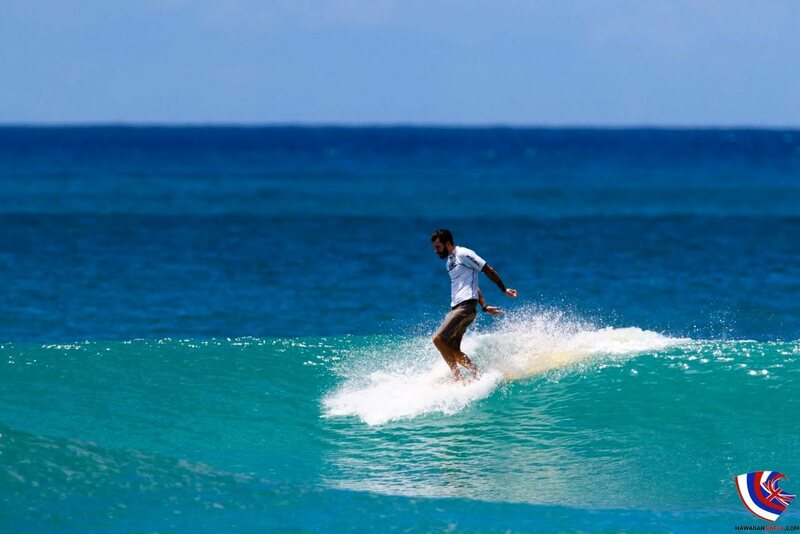 The festival also includes a number of surfing events, including a Keiki Surf Competition, a Wahine Longboard Competition, a Kane Longboard Competition, and tandem events. There are also opportunities for the endurance athletes interested in a swim, paddle, and/or run event.